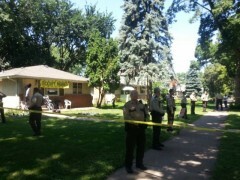 Minneapolis: 2 arrests as community stops illegal eviction attempt of Ceballos home | Fight Back! Minneapolis, MN - 75 community members turned back 30 sheriffs who were trying to evict people from the Ceballos home, July 24. Two home defenders were arrested in acts of civil disobedience. Under orders from Sheriff Richard Stanek, deputies kicked in the door without warning at 12:40 p.m. One home defender was cut out of a barrel filled with concrete by deputies wielding a jackhammer and saw. During the eviction attempt, community members drove sheriffs into the backyard, where they retreated after boarding up the property. The Ceballos' family, friends and neighbors removed the boards and returned into the home. JPMorgan Chase Bank had told the Ceballos family that they were considering them for a loan modification, but then filed for eviction at the same time. This process is known as dual tracking and is illegal under the national mortgage settlement. On July 22, Chase asked for another loan modification application from the Ceballos family, which they accepted July 23. "Yesterday we went to Chase because they said they would help us," said Jonathan Ceballos. "Today the sheriffs show up at our house to evict. The question is, to the sheriffs and to Chase - who are you helping? They want to see another empty house but it's not going to happen, because we the people are here to support one another. We hope Mayor Rybak will not send police to attempt another eviction of my family while we continue to negotiate with the bank. We don't need any more arrests." The Ceballos family lives in south Minneapolis' Eviction Free Zone, a community where neighbors have pledged to stand up against unjust evictions.